One of the leading financial journalists of our time, James Grant is obviously a very smart, very well read, commentator on contemporary business and finance. He also has published several highly regarded historical studies, and according to the biographical tag on his review of a new book on the monetary role of gold in the weekend Wall Street Journal, he will soon publish a new historical study of the dearly beloved 1920-21 depression, a study that will certainly be worth reading, if not entirely worth believing. Grant reviewed a new book, War and Gold, by Kwasi Kwarteng, which provides a historical account of the role of gold in monetary affairs and in wartime finance since the 16th century. Despite his admiration for Kwarteng’s work, Grant betrays more than a little annoyance and exasperation with Kwarteng’s failure to appreciate what a many-splendored thing gold really is, deploring the impartial attitude to gold taken by Kwarteng. Exasperatingly, the author, a University of Cambridge Ph. D. in history and a British parliamentarian, refuses to render historical judgment. He doesn’t exactly decry the world’s descent into “too big to fail” banking, occult-style central banking and tiny, government-issued interest rates. Neither does he precisely support those offenses against wholesome finance. He is neither for the dematerialized, non-gold dollar nor against it. He is a monetary Hamlet. He does, at least, ask: “Why gold?” I would answer: “Because it’s money, or used to be money, and will likely one day become money again.” The value of gold is inherent, not conferred by governments. Its supply tends to grow by 1% to 2% a year, in line with growth in world population. It is nice to look at and self-evidently valuable. Evidently, Mr. Grant’s enchantment with gold has led him into incoherence. Is gold money or isn’t it? Obviously not — at least not if you believe that definitions ought to correspond to reality rather than to Platonic ideal forms. Sensing that his grip on reality may be questionable, he tries to have it both ways. If gold isn’t money now, it likely will become money again — “one day.” For sure, gold used to be money, but so did cowerie shells, cattle, and at least a dozen other substances. How does that create any presumption that gold is likely to become money again? Then we read: “The value of gold is inherent.” OMG! And this from a self-proclaimed Austrian! Has he ever heard of the “subjective theory of value?” Mr. Grant, meet Ludwig von Mises. Grant, in his emotional attachment to gold, feels obligated to defend the metal against any charge that it may have been responsible for human suffering. Shelley wrote lines of poetry to protest the deflation that attended Britain’s return to the gold standard after the Napoleonic wars. Mr. Kwarteng quotes them: “Let the Ghost of Gold / Take from Toil a thousandfold / More than e’er its substance could / In the tyrannies of old.” The author seems to agree with the poet. I myself hold the gold standard blameless. The source of the postwar depression was rather the decision of the British government to return to the level of prices and wages that prevailed before the war, a decision it enforced through monetary means (that is, by reimposing the prewar exchange rate). It was an error that Britain repeated after World War I. This is a remarkable and fanciful defense, suggesting that the British government actually had a specific target level of prices and wages in mind when it restored the pound to its prewar gold parity. In fact, the idea of a price level was not yet even understood by most economists, let alone by the British government. Restoring the pound to its prewar parity was considered a matter of financial rectitude and honor, not a matter of economic fine-tuning. Nor was the choice of the prewar parity the only reason for the ruinous deflation that followed the postwar resumption of gold payments. The replacement of paper pounds with gold pounds implied a significant increase in the total demand for gold by the world’s leading economic power, which implied an increase in the total world demand for gold, and an increase in its value relative to other commodities, in other words deflation. David Ricardo foresaw the deflationary consequences of the resumption of gold payments, and tried to mitigate those consequences with his Proposals for an Economical and Secure Currency, designed to limit the increase in the monetary demand for gold. The real error after World War I, as Hawtrey and Cassel both pointed out in 1919, was that the resumption of an international gold standard after gold had been effectively demonetized during World War I would lead to an enormous increase in the monetary demand for gold, causing a worldwide deflationary collapse. After the Napoleonic wars, the gold standard was still a peculiarly British institution, the rest of the world then operating on a silver standard. The classical gold standard, in service roughly from 1815 to 1914, was certainly imperfect. What it did deliver was long-term price stability. What the politics of the gold-standard era delivered was modest levels of government borrowing. The choice of 1815 as the start of the gold standard era is quite arbitrary, 1815 being the year that Britain defeated Napoleonic France, thereby setting the stage for the restoration of the golden pound at its prewar parity. But the very fact that 1815 marked the beginning of the restoration of the prewar gold parity with sterling shows that for Britain the gold standard began much earlier, actually 1717 when Isaac Newton, then master of the mint, established the gold parity at a level that overvalued gold, thereby driving silver out of circulation. So, if the gold standard somehow ensures that government borrowing levels are modest, one would think that borrowing by the British government would have been modest from 1717 to 1797 when the gold standard was suspended. 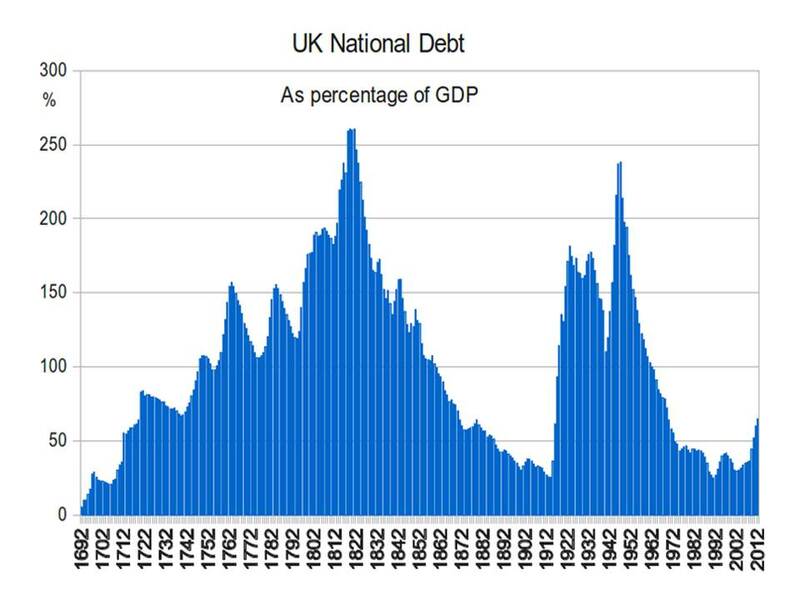 But the chart below showing British government debt as a percentage of GDP from 1692 to 2010 shows that British government debt rose rapidly over most of the 18th century. Grant suggests that bad behavior by banks is mainly the result of abandonment of the gold standard. Progress is the rule, the Whig theory of history teaches, but the old Whigs never met the new bankers. Ordinary people live longer and Olympians run faster than they did a century ago, but no such improvement is evident in our monetary and banking affairs. On the contrary, the dollar commands but 1/1,300th of an ounce of gold today, as compared with the 1/20th of an ounce on the eve of World War I. As for banking, the dismal record of 2007-09 would seem inexplicable to the financial leaders of the Model T era. One of these ancients, Comptroller of the Currency John Skelton Williams, predicted in 1920 that bank failures would soon be unimaginable. In 2008, it was solvency you almost couldn’t imagine. Once again, the claims that Mr. Grant makes on behalf of the gold standard simply do not correspond to reality. 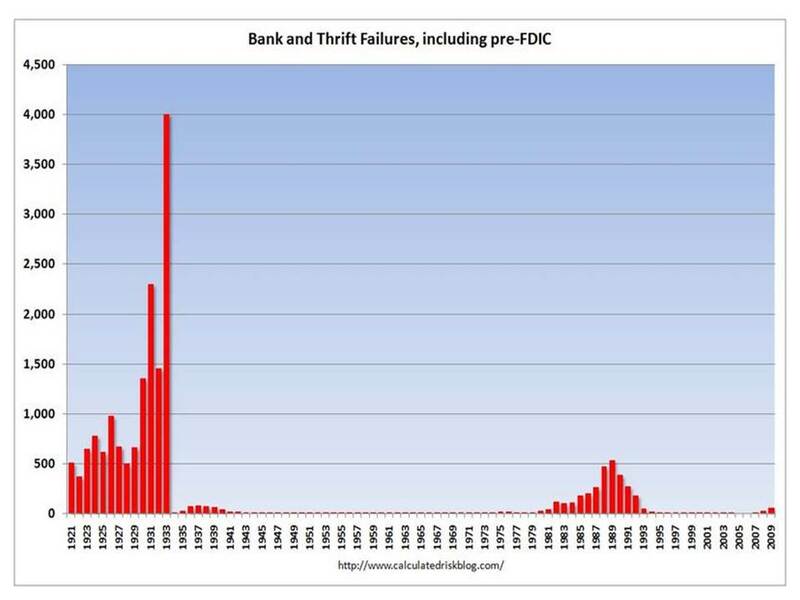 The chart below shows the annual number of bank failures in every years since 1920. Somehow, Mr. Grant somehow seems to have overlooked what happened between 1929 and 1932. John Skelton Williams obviously didn’t know what was going to happen in the following decade. Certainly no shame in that. I am guessing that Mr. Grant does know what happened; he just seems too bedazzled by the beauty of the gold standard to care.